Our Orion SkyQuest XT6 Classic Dobsonian telescope can open up limitless observing possibilities for you and your entire family. With excellent light grasp, point-and-view ease of use, convenient portability, and a low price that can't be beat, the XT6 Classic Dobsonian reflector should be on the top of any beginner's telescope wish-list. Built around a big, 150mm diameter parabolic primary mirror, the XT6 Classic Dobsonian collects nearly 80% more light than a 4.5" reflector telescope, rendering brighter views of the cosmos with greater detail noticeable when viewing deep-sky objects such as open and globular star clusters, nebulas, and brighter distant galaxies. With a long focal length of 1200mm and resultant focal ratio of f/8, the XT6 Classic Dobsonian performs especially well at planetary and lunar observation. Brighter planets such as Jupiter, Saturn, and Mars show an impressive amount of detail when viewed through the XT6 Classic. Jupiter's four brightest moons are easily visible surrounding the Jovian giant, and its cloud band "stripes" display nicely. If timing and good seeing conditions permit, you can even glimpse Jupiter's Great Red Spot (which has become more of a beige color in recent years) through the XT6 Classic Dobsonian reflector telescope. Saturn's stunning rings are quite a sight when looking through the SkyQuest XT6 Classic, with clear evenings providing views of the Cassini division between the rings, and even of Saturn's gigantic moon, Titan. When Mars cooperates with a clear atmosphere free of dust-storms, the XT6 Classic Dobsonian and its winning combination of aperture and focal length will yield great views of martian surface markings and polar icecaps. The 45"-long enameled-steel XT6 reflector optical tube glides with silky smoothness on the cabinet-quality Dobsonian wood base equipped with non-stick PTFE/Nylon altitude and azimuth pads. You just point the Dobsonian telescope and view! Orion-engineered CorrecTension springs keep the tube balanced to perfection for smooth, precise position adjustments. The SkyQuest XT6 Classic Dobsonian is outfitted with a smooth-adjusting 1.25" PTFE-lined rack-and-pinion focuser which accepts any 1.25" telescope eyepiece. A 25mm Sirius Plossl 1.25" eyepiece is included, which provides 48x power magnification right out of the box. An included Orion EZ Finder II reflex sight allows precise aiming of the XT6 Classic following a simple alignment procedure. The 150mm diameter primary mirror is center-marked to make collimation adjustments easy and precise, and a collimation cap is included. 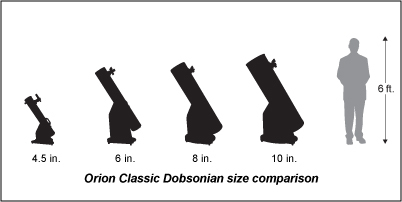 The XT6 Classic is surprisingly easy to transport thanks to its uncomplicated design, even though many people refer to Dobsonian telescopes as "cannons" due to their relatively large size. The XT6 consists of two main components: the 6" optical tube and the stable Dobsonian base. Simply place the 13.5 lb. wooden base down where you want to observe, and then place the 20.9 lb. reflector optical tube assembly onto the base and secure in-place with the CorrecTension springs on both side of the telescope tube. That's it! Alternatively, the XT6 can be carried as one, 34.4 lb. unit. With the tube securely attached to the base with the CorrecTension springs, simply lift the assembled XT6 Classic carefully using the base handle. There currently are 1811 guests online.